We've partnered with our friends at Monti Kids to empower families at home with the leading infant toddler curriculum: Montessori. While many families don't become aware of Montessori until their children are school-aged, there are many benefits of using the Montessori philosophy at home, starting from birth. The first three years of a child's life are arguably the most important in terms of development. "Eighty-five percent of the brain is formed by age three and these earliest years lay the foundation for all future learning," says Zahra Kassam, an internationally trained Montessori teacher and the founder of Monti Kids. This is the time when children develop their sense of self and their sense of their place in the world. We want our children to emerge from infancy and toddlerhood feeling confident, independent and supported, and the Montessori approach can help parents achieve just that. While using Montessori at home might sound daunting, especially in the already overwhelming time of welcoming a new baby into your family, there are a few very simple things you can do to begin using Montessori from birth and Monti Kids can make it even simpler. Maria Montessori wrote that children three and under have an "unconscious absorbent mind." Babies do not need to consciously try to learn new things as they already absorb everything around them. Their environment becomes a part of who they are. Because of the enormous impact of a baby's environment, it's important to put some thought into designing a room for them that isn't just cute, but supports them developmentally. Montessori nurseries are simple, orderly and aesthetically pleasing. They are beautiful, but also calm with plenty of open space and, ideally, natural light. Two things that are done a little differently in a Montessori nursery are the sleeping area and the baby's play area: Many Montessori families opt for a floor bed rather than a crib—this can be as simple as a low firm mattress on the floor, although bed frames for floor beds are also available. This allows the baby to see their whole room with an unobstructed view and gives them the ability to get in and out of bed on their own once they start to crawl. A baby's play space can simply be a simple rug or mat on the floor. You will often find a mirror on the wall as even young infants seem mesmerized by their own reflections. A mobile is generally hung above the baby's play area. There is a specific progression of Montessori mobiles designed to follow newborns' developmental needs, progressing from simple black and white images to different shades of the same color as baby develops. A program like Monti Kids includes these beautiful mobiles in its Level 1 materials, as well as informative articles and videos to help you set up the ideal play space for your infant. Montessori nurseries also use a low shelf to store baby's toys. This way, the baby can see the toys and become intrigued. They will eventually learn to roll, scoot, or crawl over and select a toy from the shelf on their own. Putting things within a child's reach is one of the ways that Montessori encourages independence, from birth all the way through school. From birth, infants are absorbing language. The way we communicate with our infants can have a real impact on their language development, as well as how they perceive themselves. There are a few things Montessori parents and teachers do differently when it comes to communication. Tell the baby what you're doing: Even if it seems much too early for your baby to understand you, try telling them what you're doing, such as when you're going to change their diaper and talk to them about each step. Tell them you think they might be hungry and you're going to see if they want some milk. We don't know exactly when babies can understand what we're saying, but your baby will feel the respect you're showing them even before they can understand the words. Ask permission: In the Montessori approach, we always ask permission before picking up a baby. We approach the baby from the front so that they can see us coming, rather than picking them up from behind. We might say, "you look tired, may I pick you up to bring you to your bed?" If you ask questions and wait for a response, you may be surprised at how soon your baby will respond in some way. Use real words and rich details: Using rich language with your baby from birth is a great gift to your child. This is the time when she is listening closely, absorbing all of the language around her, so why not use the real words for things rather than simplified versions? Why not describe the view out your window in great detail so that they have the chance to hear beautiful language? The materials provided through Monti Kids offer interesting textures and colors, giving you lots of sensorial details to talk about with your baby. Freedom of movement is a hallmark of Montessori classrooms, where children are free to walk around the room and sit where they please. This same principle applies to babies. In the first year of life, learning to move and control their body is one of a baby's most important jobs. They are naturally driven to gain these new skills—to bring hand to mouth, to lift their head, to roll over. All we really have to do is get out of their way. 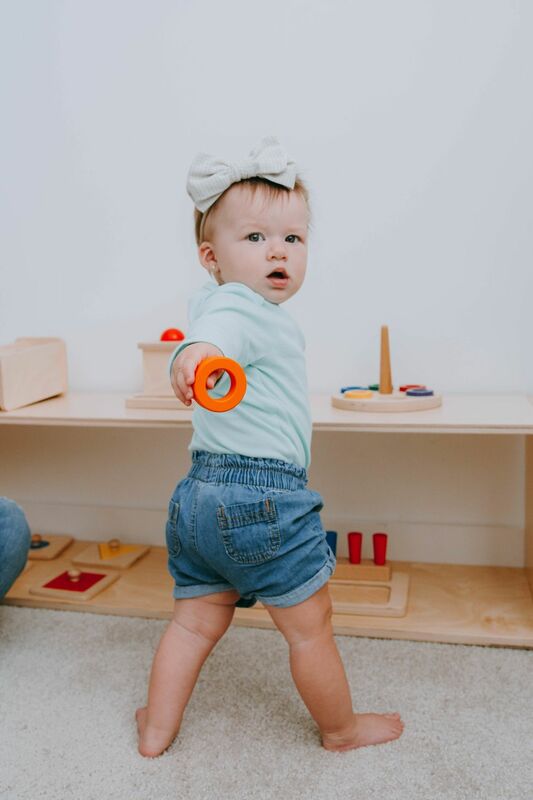 The Montessori approach does not use devices like swings and bouncy seats for babies, but instead gives them lots of free time on the floor to work on their growing skills. Helping you make the most of this floor time, Monti Kids deliveries include items like grasping toys to develop baby's hand muscles and textured balls that roll slowly, which encourage baby to start to scoot and crawl. When a baby is learning to move, it's important to have a very safe space for them, likely their room, that is 100% child-proofed so they can begin to explore without being told "no" all of the time. Montessori also supports natural gross motor development. We do not prop babies up in positions they can't yet reach on their own, such as sitting or standing. Letting them learn how to sit and stand and walk on their own gives them a great sense of confidence and pride in their achievements. While we don't generally think of babies as independent, there are ways that you can support their developing independence as they grow, and one of these is providing independent play time. Babies need lots of time with you being held and snuggled and loved, but they also benefit from time to play on their own. For an infant, this might mean playing in their play area while you sit nearby, simply watching. Giving a baby time to take in the world without distraction gives them the sense that they can do things on their own—they'll let you know when they want to interact. As your baby grows, independent play might mean observing while they play with simple toys, fighting the urge to always play with them or show the "right" way to use something. Montessori toys for babies are simple, made from natural materials and non-electronic. They are open-ended and meant to spark baby's curiosity and help her explore her emerging skills. 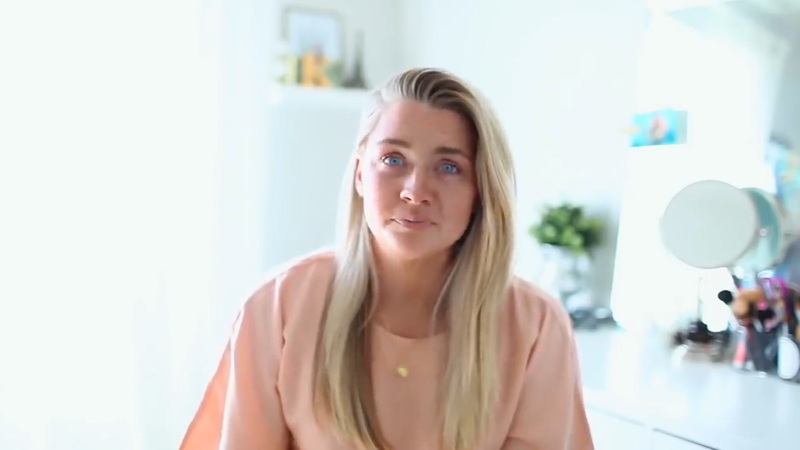 Monti Kids deliveries even include short videos to guide you through how to introduce each new material, and then step back and observe your child making her own discoveries. Many parents want to use Montessori at home, but it can feel complicated and intimidating. 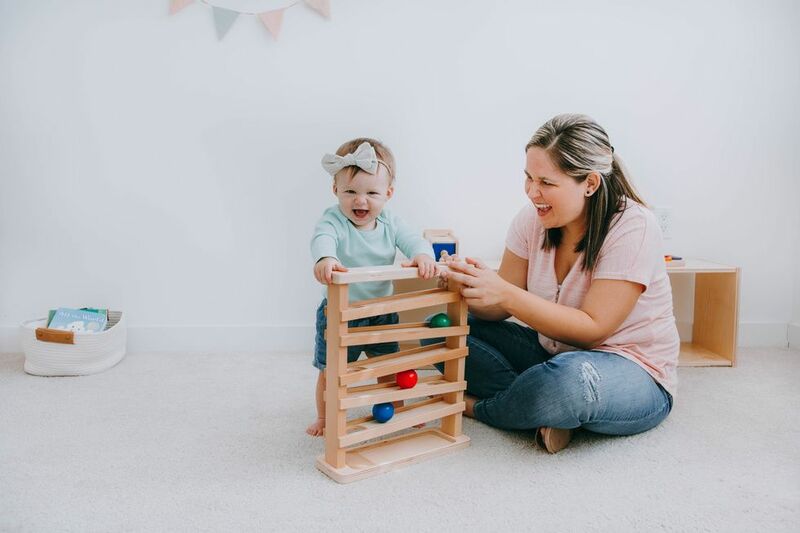 Monti Kids can help provide the scaffolding you need to use this philosophy at home, giving you confidence that you're supporting your baby's needs and raising a highly capable and independent child. This article was sponsored by Monti Kids. Thank you for supporting the brands that support Motherly and mamas. Christina is a Montessori teacher certified by the American Montessori Society. She currently stays home to take care of her son, James. She lives in Austin, Texas, and writes a blog, http://montessoriishmom.com, chronicling her journey through motherhood the Montessori way. Monti Kids was founded by Zahra Kassam, an internationally certified Montessori teacher, who also holds a BA in Psychology and a Master's in Education, both from Harvard University. After becoming a mother, Zahra was frustrated that parents of newborns are left guessing how to support their baby's learning and development. To solve this problem, she created Monti Kids, a learning program for families at home based the Montessori method. Zahra leads a team of child development experts at Monti Kids' headquarters in Orinda, California, where she also resides with her two young children.